Diving with Deep Blue Divers is loads of fun and entertainment. We are a PADI 5 star resort located at the North pacific coast of Costa Rica, the Papagayo Gulf which is widely known as one of the hot spots for scuba diving in Central America. We offer a wide range of scuba diving activities from daily local diving, advanced island diving at the Catalina and Bat islands as well as scuba instructions for beginners up to the PADI assistant instructor level. 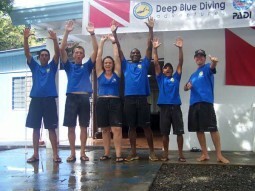 Founded in 1998 Deep Blue Diving Adventures established his place in the local market by providing best service with the right feeling to make our customers happy. Once you’re out on our custom desinged dive boats you will know what makes us different. Our goal is to provide a fun and safe day of diving you will never forget. Service is our success. All dive trips include Tanks, weights, soft drinks, local fresh fruits, cookies, tortilla chips, Salsa, Divemaster, full equipment service and all the fun. We are the only Nitrox facility in Playas del Coco. Price: 2 tank local boat dive is just $79! On our website are dive packages with the best hotel in town available.